Hidden Gems of MP - Into the Wilds of Sanjay National Park & Raneh Canyon ~ The Wandering Soul's Wander Tales..
A blur of black whizzed past the thicket ahead of me in Sanjay National Park, a remote corner in Madhya Pradesh. If not for the rustle of the dried leaves that raked up few exciting seconds of anticipation, I would’ve definitely missed my first ever sighting of the elusive Sloth Bear in the jungles of this tiger reserve, which were so thick that a Tiger could’ve been right next to me and I wouldn’t have had any inkling whatsoever. The jungles of MP's Sanjay National Park are so dense and unchartered that you literally forge your own path! Sanjay National Park, only recently opened for tourists after playing host to wildlife rehabilitation for years, is now apparently home to a thriving Tiger population of over 40, spread over 831 Sq Kms shared between Sanjay National Park and Dubri Wildlife Sanctuary. But apart from tigers, these forests are brimming with a variety of wildlife that makes it an exciting place to be for the nature lover. Considering the park has been recently opened for visitors, that there is only one wildlife resort in the vicinity and there are only two safari vehicles in all, wildlife spotting in Sanjay National Park is as real as it gets without any external influences yet. It was a cold morning with a blanket of mist hanging over the tile-roofed houses dotting the vast fields we were cutting across. At the forest gate, at a distance of 11km from Parisili Resort (Read: Where I stayed), we took a diversion to the right leading into the forest instead of going through the gate. This set the tone for how the safari would proceed over the next few hours. From driving through the shallow River Mudari that looked more like a blanket of water flowing over fertile lands to forging our own paths through the seemingly impenetrable jungle, the wildlife viewing experience here was quite novel. Chinkaras, which normally wouldn’t move an inch at the intrusion in other popular national parks, would jump at the slightest disturbance here. Watching them observe us through the gaps between dense foliage felt way more real. Piercing through the heart of the jungle with the overgrown foliage whipping me occasionally in the face, things suddenly took a turn for the better when I was about to give up any hope of sighting wildlife in a forest with such low visibility and where animals are not used to human presence. A big sloth bear made a noisy exit into the forest startled by the approaching vehicle. Sloth bears aren’t that graceful in showing themselves to eager visitors normally, so this felt special than a tiger sighting. Soon after, another sloth bear ambled by the shores of a watering hole making it a jackpot of sorts. The only thing that could’ve made the day better was a leopard sighting but there’s a limit to greed. Content with the unexpected sighting in a little known jungle, I suddenly realized how commercialised the wildlife safaris have become. With tens of other vehicles ogling at the lone tiger elsewhere, a very real but quick sighting felt so much more personal and intriguing. It was like a little secret between the jungle and me; a small but privileged glimpse into its world of wonders. On my way to Khajuraho, there was a little detour to a place called Raneh Falls that frankly sounded quite uninteresting. In a sleepy stupor from long journeys of the previous days, I ambled into the viewing enclosure to see the canyon that’s in the path of Karnavati River (or Ken River for short). It wasn’t until the guide mentioned that the pure crystalline granite canyon was over 5kms wide and was formed by volcanic action millions of years ago did I wake up to pay attention. The igneous rocks were columnar and looked otherworldly, typical of volcanic formations. From pink to black, the granite, basalt, jasper, quartz and dolomite rocks that form the canyon wore at least five different colors making it a unique sight – according to our guide, this is the only place in the world where these five rocks are found together. Owing to the dry spell of winters, Raneh waterfall, one of the more prominent ones of the several waterfalls that form on the canyon, wore a forlorn look but it was abundantly clear that during wet season, Raneh Falls would be roaring. In fact, the best time to see the waterfalls is during monsoons when more than a 100 hundred waterfalls dot the canyon making it a sight to behold. However, winter is the best time to see the canyon itself that bares its form after the waters recede. 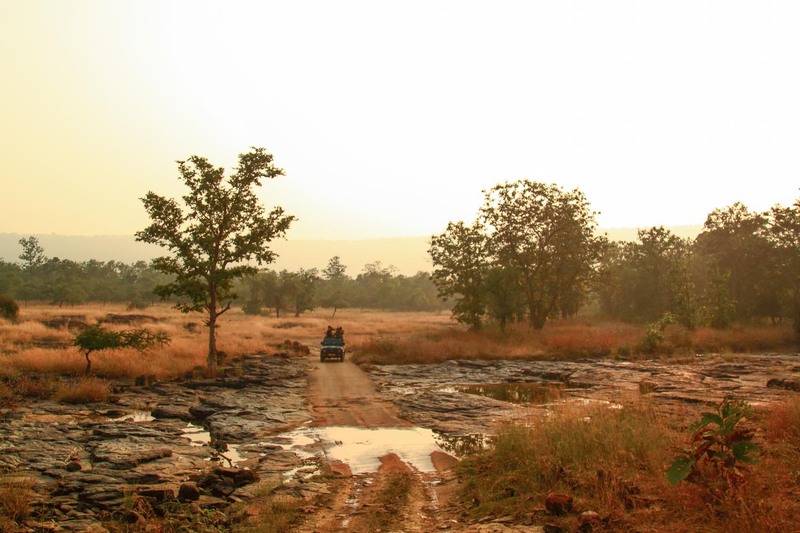 While Panna National Park may not be a hidden gem exactly, it’s gorges sure are! Ken River cuts through the heart of Panna and is the lifeline of its wild inhabitants. It has forged its path through the landscape forming a deep ravines and cliff edges that are great for observing vultures, crocodiles and other wildlife apart from the usual repertoire of MP’s more famous national parks. Great Indian Vulture flying in the canyon at Dhundua Waterfall cliff edge. Panna National Park is probably one of the country's few conservation stories that recorded a surprisingly remarkable turnaround. From loosing all its tigers in 2009 to the steady success of tiger reintroductions from Kanha and Bandhavgarh, Panna has bounced back to normalcy after a period of despair. No wonder these jungles are full of revving safari vehicles apart from its wild denizens today. While I wouldn’t even remotely imply in any way that sighting a Tiger isn’t as special as it is made out to be, I would highly recommend exploring other landscapes that support a variety of wildlife once you’ve seen a tiger. There’s so much diversity in our jungles that it is nothing but a crime that the spotlight should be shining forever on the yellow stripes! So have you visited any of these places? Let me know in the comments if you know of other such hidden gems in Madhya Pradesh. Note: This post is published as part of the #ChaloMPwithHolidayIQ campaign and I was hosted by HolidayIQ in Madhya Pradesh, in collaboration with MP Tourism. Panna stands out for its gorgeous landscape. Raneh in the rains should be beautiful. I suppose so, Raneh was quite a pleasant surprise! Planning to do six weeks around MP so been scouring your blog for details. Added Rewa and Govindghar into our itinerary and planning to do 2 Safaris... Any suggestions of which two jungles we should check out ? Also any other don't miss stuff (other than the usual) you can point us towards ? Six weeks in MP sounds great! You'll be spoilt for choice. I hope you are planning to spend a lot of time around Orccha, Datia and Morena as well? Super underrated places they are! Coming to jungles, really hard to pick two but I might be inclined to say Kanha, which I think is the most magical of all forests in MP and Satpura, where I haven't been to but been hearing rave reviews from many. Between Kanha and Satpura, you would be able to visit one famous and one offbeat park. Also, do look into waterfalls around Indore, there seem be to plenty of stunning waterfalls around. Have a great trip, you guys! Hi Neelima, I am visiting Lucknow for an official trip from Bengal (the job ends on 10 July in Lucknow) but am planning to extend the trip for 7 days before I come back; became interested in Rewa and read your blogs; Can you kindly help me out- in planning a 4-5 days trip in the north-east Madhya Pradesh from Lucknow (i plan to come back to Lucknow before i return to Bengal); I am interested in Rewa-the palaces and the lake, purba and other waterfalls, etc.